Europe is set for thunderstorms this week as temperatures rise in the north, but remain chilly further east. There will be “increasing amounts of sunshine” in London and Paris, despite temperatures dropping across Spain and Portugal. BBC Weather presenter Stav Danaos said: “It’s been very unsettled over the Mediterranean in the last week or so. Temperatures well below the seasonal average, plenty of showers and thunderstorms, certainly over the weekend here. We have also seen this area of low pressure pushing into western parts of the continent, bringing more cloud, outbreaks of rain to Ireland then pushing on in towards the British isles during the course of Tuesday and into France as well. “However, a big area of high pressure will continue to build in across Scandinavia and the northeast, that will settle things down further and allow temperatures to rise across the north of Europe. “Further east in the Mediterranean it looks pretty unsettled, much of Tuesday further showers and thunderstorms, fairly strong and chilly winds too. The BBC Weather host continued: “We will see that area of cloud across the northwest melt away as we head on in towards Wednesday. “Then we will start to import some warmer air across this northwest corner, so temperatures on the rise, for example in London and Paris increasing amounts of sunshine. “But it starts to turn wetter, windier and cooler across Spain and Portugal. 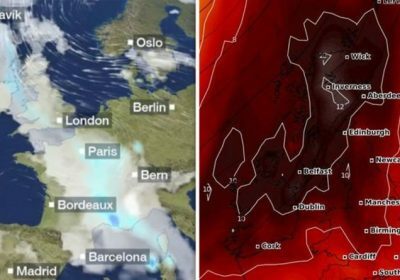 “See the temperature drop there for Madrid as the week wears on, whereas for London and Paris those temperatures rising to the low 20C in fact towards the end of the week and into the Easter weekend. There will be bright and sunny weather, carried on a southeasterly wind. Sunny weather is expected for the Easter weekend with temperatures that could reach the low 20C’s.